Kuyper's Music is the Johannus Organ Company's exclusive representative for Iowa. Are you attracting new people? Do you want to enhance your service? We can help. Our vision is to create a better musical environment by providing organs at prices as many churches as possible will be able to afford whether it's $10,000 or $500,000. We have been installing electronic church organs since the late 1940's so you can count on our experience to give you the best installation possible. We then tonally finish the instrument to your taste and room. Whether choosing a digital organ, pipe organ or hybrid organ, or console replacement we can assist you with all your needs. A digital organ from Johannus that duplicates the sound of a pipe organ is the perfect choice for churches of all denominations, homes or institutions. Priced well below what you'd expect you'll experience a truly magnificent sound at a very affordabel price. Since 1917 the Kuyper family has stood behind everything we sell and have a reputation for exceptional treatment of all our customers. If you live in Iowa, Nebraska or anywhere in the Midwest you'll be glad you asked Kuyper's to work with you. To learn more about the Johannus organ line call the us at 515-223-6439 to set up an appointment. You can also email us at organs@kuypersmusic.com. Find out more about what makes a Johannus organ special. Click here to visit Johannus's web site for more information. Kuyper's Music also represents Makin organs. The Makin organ, built by Johannus, comes from England and is designed specifically for the Anglican worship service. All of the ranks are sampled from the finest instruments that England has to offer, hand selected by organists who play in the Anglican Church community. To visit Johannus's Makin organ web site for more information, click here. The Monarke church organ is inspired by famous pipe organs. Introducing a new era in church organ building these instruments are tailor made from start to fininsh. A truely remarkable instrument of your own design, or we can help. 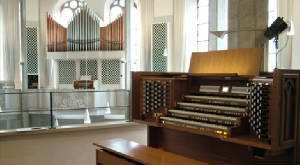 click here to visit the Monarke church organ web site. The Monarke home organ is also built to your specifications in every detail. You can now have an organ that adds beauty to your home as well a truly great should.